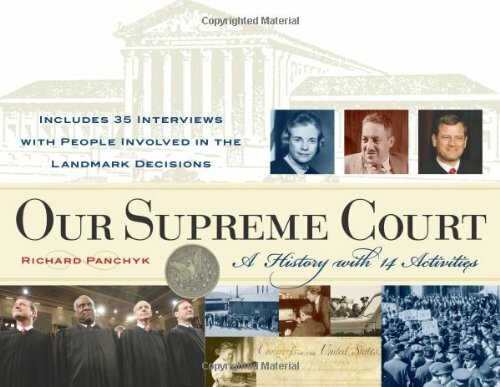 This lively and comprehensive activity book teaches young readers everything they need to know about the nation's highest court. Organized around keystones of the Constitution-including free speech, freedom of religion, civil rights, criminal justice, and property rights-the book juxtaposes historical cases with similar current cases. Presented with opinions from both sides of the court cases, readers can make up their own minds on where they stand on the important issues that have evolved in the Court over the past 200 years. Interviews with prominent politicians, high-court lawyers, and those involved with landmark decisions-including Ralph Nader, Rudolph Giuliani, Mario Cuomo, and Arlen Specter-show the personal impact and far-reaching consequences of the decisions. Fourteen engaging classroom-oriented activities involving violations of civil rights, exercises of free speech, and selecting a classroom Supreme Court bring the issues and cases to life. The first 15 amendments to the Constitution and a glossary of legal terms are also included. About Senator John Kerry (Foreword) : Senator John Kerry is credited in children's books. A published credit of Senator John Kerry is Our Supreme Court: A History with 14 Activities (For Kids series). About Nadine Strossen (Introduction) : Nadine Strossen is credited in children's books. A published credit of Nadine Strossen is Our Supreme Court: A History with 14 Activities (For Kids series).